· A yarmulke and tzitzis must be worn at all times (off-hours as well). No leather, knitted or bright colored yarmulkes allowed. · Pants: Black or navy blue pants (no jeans, oversized-cargo pockets or skin-tight pants allowed). · Shirts: Button down shirts (white, blue or light blue with white stripes. No t-shirts, polo shirts or collarless shirts). Shirts should be tucked in at all times (except during play time). White shirts should be worn on Rosh Chodesh and Chassidishe Yomim Tovim. · Sweaters: The Cheder sweater or a plain navy blue sweater may be worn. · Shoes: No sandals, crocs or heelies allowed. Shoes need to be dark colored and conservative looking. No white or bright colors on them. · Boys who are in 7th & 8th grade may wear only white shirts, a plain dark yarmulka without any writing. Boys who reached Bar Mitzvah age must come to Cheder every day with a hat and a dark colored suit jacket or blazer for davening and bentching. Zippered jackets or sport jackets are not acceptable. · Hygiene: Students are expected to bath/shower, brush their teeth and dress in clean clothing. · Hair: students are expected to take short haircuts and maintain short hair. Payos should reach the ear lobe. 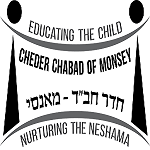 A students who isn’t dressed according to the cheder dress code will wait by the office until he is taken home or proper clothing is provided. Women: skirt length below the knee, closed necklines and sleeves covering the elbow. Married women must cover all their hair. Friends or relatives who participate in school functions are expected to respect our values.